It was one thing to mistake a Hong Kong vigil for Tiananmen Massacre victims for a fund-raising event for earthquake victims. It was entirely another to actually publish a picture depicting a scene, albeit a subtle one, of the massacre in the newspaper. But after nineteen years of tight control in the official media blackout, something is bound to slip through the cracks. It happened last week. 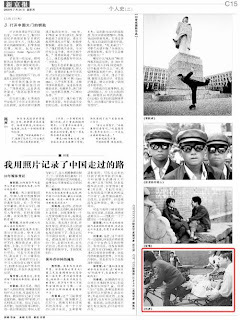 A popular Beijing newspaper, The Beijing News (新京报), inadvertently included a photo of the massacre as one of the remarkable news pictures taken throughout the career of a photo journalist. The photo, seen below in the lower-right corner of a scanned image of the paper, was discreet and simply labeled as "the wounded". Yet the imagery is unmistakable. It was a familiar scene during the massacre, when residents carried dead and wounded to hospitals in flatbed tricycles. Li Datong, a veteran state newspaper journalist who was forced from a top editing job for reporting on sensitive subjects, said the photograph was likely put in the paper by a young editor who was unaware of its background. "A lot of editors now are really young. News about June 4 has been off-limits. They don't have any memory of it, so they'll think it's just a regular wounded person," Li said. Editors at Beijing News would definitely be punished for the slip-up, he said. "They'll be lucky if they don't get fired. This is a major political error." The paper is being recalled off the streets of Beijing and its web site censored.